Frederick Charles Hands influenced the organ scene during the 1920's and 1930's, yet today his name is never mentioned in the various books and magazines. Frederick was born in Burton Walks in Loughborough, Leicestershire, to parents Joseph and Alice on 17th March 1889 - his father, Joseph, was a local solicitor. In the early 1920's Fred acquired a factory at 80 Selhurst Street, off Radford Road, Hyson Green, Nottingham and was listed in the telephone directory as "Organ Builder (Mechanical)". He was also known amongst showmen as an engineer. He lived in a showman's living van inside the factory and also owned a 6.5hp showman's engine with which he helped with showman's haulage. He did various engineering jobs and also cut music for showman's organs. He used to travel to fairs or wakes, taking his home and engine to where ever his engineering skills, haulage or electric power was needed. In the early 1930's he acquired a Douglas Twin motorbike enabling him to travel to more distant jobs requiring his engineering expertise. One night, coming back from Huddersfield, he had an accident and was badly injured, spending twelve months in hospital and convalescence. It resulted in him having to wear irons on his legs and a support to his right hand that he devised and made himself. It was during his visits to Germany to the Bruder factory that he invented the "Hands Auto Paper Roll Player". 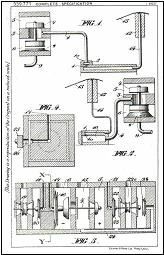 This he patented in 1930. When the roll was rewinding the roll played a drum and piccolo solo. This allowed the organ to automatically play all day and cut out the need for someone to change the music. One of his unsuccessful achievements was to convert a set of gallopers to a "Ski" ride. It did not catch on and the ride ended up in Bob Bramley's yard at East Leake (Bob was a carpenter and wheelwright) where the ride deteriorated and was eventually scrapped. As the war clouds gathered in Europe, Fred's business deteriorated and prior to the 1939 war being declared on Germany, Fred's organ side of the business had virtually collapsed. Then tragedy struck, on 29th August 1939, Fred fell in a faint and accidentally disconnected a gas pipe and gassed himself. The inquest was held on 31st August 1939 in Nottingham and the Coroner was W J Rothera. Unfortunately the Coroner's report on his death has not survived and it is thought was destroyed during a bombing raid in Nottingham. At the auction sale which took place after his death 1 43 key organ was sold for £45 and a barrel organ for under £10 - both in perfect playing order!